WASHINGTON – Arizona candidates – and their allies and opponents – spent more than $43.5 million on Tuesday’s primary election, a “staggering” amount for the state, according to one political expert. More than half the total, $23.65 million, went for statewide races, according to the most recent campaign finance reports, with spending driven by a bitter six-way contest for the Republican gubernatorial nomination. The number is likely higher, as the last state and federal spending reports were filed several days to several weeks before Tuesday’s primary. And experts expect millions more to be spent in the 10 weeks between now and the Nov. 4 general election, which features several high-profile congressional races in addition to state offices. In races for statewide office, like governor and state treasurer, the candidates and independent expenditure committees spent a total of $23.65 million as of Friday, according to reports from the Arizona Secretary of State’s Office. A total of $7.15 million was spent on primary election campaigns for the Legislature, the reports showed. Spending in the state’s nine congressional districts totaled $12.7 million, according to Federal Election Commission reports from earlier this month. Merrill and other pros pointed to several factors that drove this year’s primary spending, including the gubernatorial primary as well as a flood of cash from sources independent of the candidates themselves. “The gubernatorial race is the one that’s breaking the bank,” said Tempe-based public opinion and marketing researcher Mike O’Neil. The pre-primary campaign filings show the major GOP gubernatorial candidates and their allies spent more than $15.2 million reaching out to voters. Tucson Republican pollster Margaret Kenski said she was not surprised by the spending so far this year. “The amount doesn’t shock me, when you consider the number of candidates and the cost of campaigns,” Kenski said. Arizona’s 2014 primary election has been awash in cash from so-called “dark money” groups that are not required to disclose their donors. Kenski said the state’s relatively strict reporting requirements for candidates ends up empowering outside groups. Of the money spent on statewide races, $6.6 million came from such independent expenditure committees, while those outside groups spent slightly more than $2.3 million to aid legislative hopefuls and hammer opponents. On the federal level, independent groups spent $1.57 million on Arizona’s congressional primaries, according to the FEC. In the hotly contested Democratic primary for south Phoenix’s 7th District congressional seat, state Rep. Ruben Gallego, D-Phoenix, reported on Aug. 6 that he had spent $486,502 in his successful campaign against former Maricopa County Supervisor Mary Rose Wilcox, who reported spending more than $427,000. Independent committees also reported spending $246,000 in support of Gallego’s candidacy. And in eastern Arizona, outgoing state House Speaker Andy Tobin, R-Paulden, spent close to $520,000 and rancher Gary Kiehne spent just over $600,000 in a race for the GOP nomination in the 1st District. As of Wednesday, however, the race was still too close to call. The winner will face Rep. Ann Kirkpatrick, D-Flagstaff, who announced Wednesday that she has already committed $1.75 million for television ads in the general election. Ruth Jones, an Arizona State University professor who teaches a course on money in political campaigns in the School of Politics and Global Studies, said the amount of money primary candidates and their supporters spent in the primaries was fairly predictable. “We know from research, the more competitive the race the more money it costs,” she said. And, Jones said, that’s not necessarily a bad thing. Merrill predicted total Arizona election-year spending could reach $60 million by the time general election spending is tabulated. But, like Jones, he said the amount isn’t that much when you consider the importance of politics and living in an open, democratic society. “How do you put a price tag on that?” he asked. 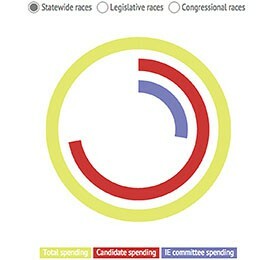 Click on the graphic to see total spent in different Arizona primary races, and the amount that came from the candidates themselves and from Independent Expenditure (IE) committees.